After leaving CW we found what was some sort of Thai taxi queue which was really a throng of people jumping in and out of taxis in no particular order. Once again Tina stepped up and after being brushed aside a few times she snagged us one and we were on our way to Banglamphu for dinner. And we then entered a familiar cycle of trying in vain to find a location recommended in one of my food guides. Even though we have a street address we failed once again. The 100 different street food stalls had somehow morphed into less than 10! I did grab a delicious isan style sausage while we wandered up and down the street. So feeling somewhat dejected and very hungry we settled on a tourist restaurant that Tina chose. I refuse to eat anywhere that is listed in Lonely Planet and although I didn't check I was certain this place would be listed. I became more dejected on opening the menu to see my pet hate, 'the western food section'. 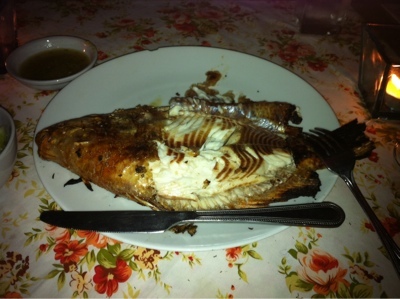 We decided against the spaghetti bolognese and chose the grilled red snapper and the fried chicken with sticky rice. To comfort myself I ordered a Piña Colada which Tina quickly copied. After all my negativity the food was delicious! Especially the snapper which was some of the tastiest fish i've tried, and the lime chilli dipping sauce really gave it some extra zest! 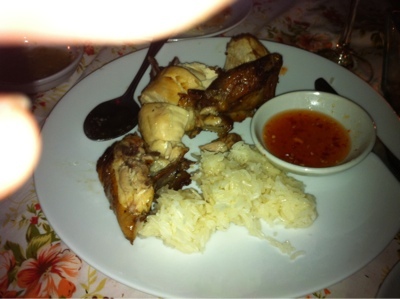 The chicken with rice is one of our favorites and was also devoured very quickly. Charlie loved both and interchangeably requested "more fish" and "more chicken". After dinner fatigue hit fast and we dragged ourself down some lovely laneways littered with clothing and food vendors and promised ourselves we would return when we had more energy. We got back to the hotel, I jumped in the pool to cool down and fell into bed exhausted. It was 8:30!